You may know Marc Doty as an educator and archivist at the Bob Moog Foundation. Alternatively, you may know of him in his artist guise as a player and demonstrator of synths through his You Tube channel and Facebook page, Automatic Gainsay. Its even possible you may have seen him sometimes on Sonicstate.com whom he credits for inspiring him to start demo-ing analog synthesizers in the first place some years ago now. Marc also even worked for a time at Paisley Park for Prince in the 90s. So this is clearly a man with an interesting story to tell. 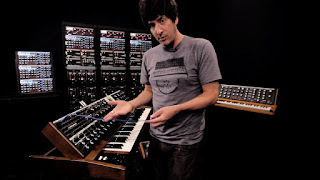 Over the years he has come to have some pretty interesting things to say about synths and synthesis too, at least to my mind, and he can argue his point reasonably and cogently. And so I wanted to seek him out and see if I could get him to answer some of my questions about synthesizers, synthesis, the burgeoning interest in modular, especially Eurorack, and the various design choices that have shaped synthesis and Electronic Music as we have it today. And I wanted to find out why Marc favors vintage analog tone too (something he's become famous for). I was very glad when Marc agreed to field my questions and what follows is the questions I asked him and the answers he gave me back. I think you'll find some things worth thinking about if synths and synthesis are things that interest you. Me: As you survey the synth scene right now, a scene currently being regularly refreshed with reissues of classic instruments like the MS-20 and Arp Odyssey (and now the Minimoog too) and also with completely new analog synthesizers being designed and built, and not only that but also with an ever-growing interest in various formats of modular synths and synthesis, do you see a synth scene that is healthy at the moment? Marc: The synth scene and synthesizer culture seems VERY healthy at the moment. As a synthesizer enthusiast, I am happy to see its popularity rise again. I am particularly happy about the recreation of my favorite vintage analog synths. Not just because I'm happy that people have access to these wonderful tools at more reasonable prices, but also because many of them lack presets. Yes, I know that presets are helpful, and patch storage is also helpful. But I want people to realize that it's possible to learn to think in the language of these synths… and when you do, you find that you can remember how patches are constructed and how to reproduce them (or at least close!). As a synthesis educator, it makes me happy that people are encouraged… or even forced… to learn synthesis. 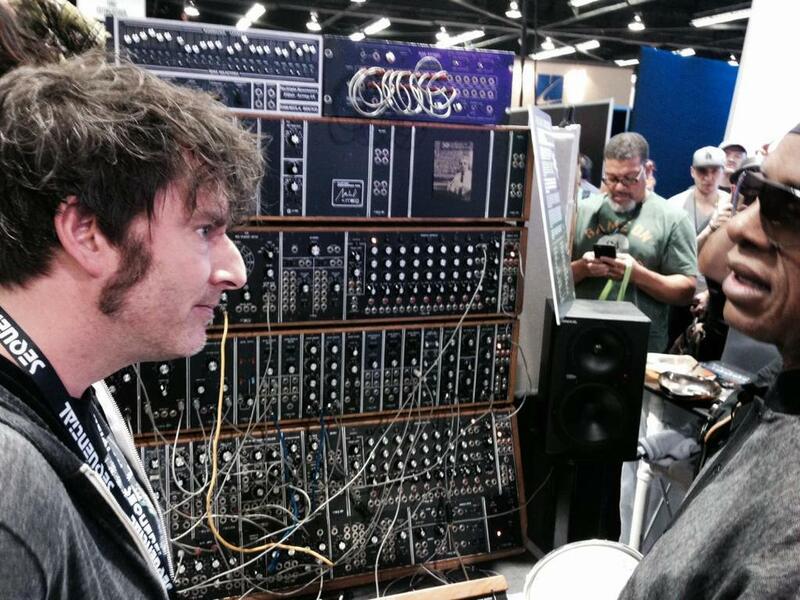 ME: In an interview in 2014 for BBoy Tech Report you described yourself as "a modular synthesist" at your core. And yet I've also seen critical (but not necessarily negative!) comments attached to you regarding the ever-burgeoning Eurorack modular scene. So, in light of this, my question to you is what do you personally see modular synthesis as being about and do you think the Eurorack scene, as far as you know it, matches up to these ideals? Is Eurorack a way of doing synthesis that appeals to you? Okay, I'm going to need to address a lot of parts of this to answer it accurately. Bear with me! I learned how to make a polysynth make sounds that I liked back in the mid-eighties. I wouldn't exactly say I learned "synthesis," but I definitely learned how to make synthesizers make cool synthesizer noises. As the years passed, I got more and more into digital synths and more and more into presets. I actually lost the ability to effectively author sounds and just constantly looked for presets that would work for what I needed. In the late 90s, I realized that I truly loved the sound and interface of analog synths from the 70s, and so I started buying them. I came to realize that I had never understood synthesis to the level of employing it to author sound… just to author synth sounds… if that distinction makes sense. As I purchased more and more complex analog synthesizers, I learned more and more about actual synthesis. In the mid-aughts, I bought a 44-space dot com system and dove head-first into the authorship of sound. It was hugely educational. Since then, no matter what synth I'm using, I think of synthesis in terms of modularity. Okay, so in 1965 we had two Americans making voltage-controlled modular synths on different sides of the country. Bob Moog, inspired by Herb Deutsch and others, pursued a conceptual design that focused on the authorship of sound. The Moog modular was a tool to author and shape sound. Don Buchla also created a means to author sound, but his focus and even intention was to create a device that allowed the authorship of new sounds and a means to create realtime performances with them. In my view, both concepts were completely valid. But I favor what is called the "East Coast" paradigm because it imposes less on my creative process. As a classically-trained musician, the performance aspect of music is an important part of my compositional process as a body. Which is to say, I spent years training my body to perform the music as I envision it. Learning an interface and interactional paradigm of a performance machine is an unnecessary step for me. And, let's face it, when we're talking about Buchla, we're not talking about a necessarily user-friendly interface… we're talking about Buchla's concept of interface, which was unique. So, for me, personally, the "West Coast" paradigm is less effective. Eurorack is fantastic. Small, convenient, inexpensive modularity made by a host of companies putting out creative and unique modules. It's really a dream come true for synthesis as a whole, and synthesists in particular. I can't imagine how anyone who is into synthesis WOULDN'T be thrilled by it. However, although Eurorack modules are diverse enough that anyone of any interactional concept could make a system that would suit their needs, there is an underlying focus in Eurorack… and it is the Buchla concept. "West Coast." And that's perfectly fine… but the focus appears to be for the average of Eurorack users the creation of automated electronic music with synthesizer sounds. Again, nothing wrong with that. But in that, the focus isn't the authorship of sound, or even the authorship of unique, expressive, etc. timbre, it is the creation of automated music of a certain style. And that is the thing that I am less interested in. I do not want or need to automate, and I definitely do not want to be pigeonholed into a style. Now granted, you can say "Marc, you can make any style you want with Eurorack," and that's true. But the movement is definitely aimed at the culture that surrounds it. I could make, for example, the additive synth I've always wanted with Eurorack. But that's not the sort of thing that is the average of the culture. So many of the devices being made are focused on triggering, sequencing, etc. And there I would be, trying to buy duplicates of standard "East Coast" type modules without any sequencing, etc. I can get that sort of thing from the few 5U makers that still exist. So, yes. I'm not anti-Eurorack, but I am somewhat alienated by the intention, interface, and culture that surrounds it. Any Eurorack enthusiast would be bored by the Eurorack system I would design. ME: Much modular synthesis as it appears today seems to tend towards plinky-plonk, bleep bloop music, if I can describe it as this. The nickname of modular users generally is "wigglers". We also see a lot of drone and soundscape music produced with these musical tools or dissonance and noise collages. I personally love (and make) these kinds of music and appreciate modulars as tools for the making of abstract sound. However, we don't seem to see so much music in which modulars are used to compose what might be described as traditional songs where the modulars are used as sound design tools crafting sounds which make up a whole containing different melodic or harmonic parts. It seems to me that, in general, attention is focused much more on creating one patch or atmosphere which is left to run. And then its on to a new patch. As more and more artists get into this equipment they seem to reproduce the same kind of things as well and the Internet is full of examples. If you accept this analysis of contemporary modular synth usage, do you approve of it or frown about it? I guess I'm asking if you think modulars are currently being made the most of or put to good use. Marc: Here is the thing about music. It can be a personal endeavor, or it can be an endeavor for the enjoyment of others. The great thing is when it is perfectly both. When it is perfectly both, you have the ideal intersection of personal expression and artistic communication. But as all musicians know, that ideal intersection is very hard to acquire for most of us! The more personal music is, usually, the less accessible it is to audiences. That is the sad truth of writing music. But I guess it's not THAT sad. If you're writing "music" for yourself that is made up of cascading electronic squeals or drawn-out drones, and you like it… that's fantastic. Being able to write music you personally like is the most important aspect of writing music, I think. But the value of music as a whole is usually measured by how it affects people OTHER than you… and that's the thing. So, if you're doing your own thing and audiences are enjoying it… it's the perfect situation. If you're doing your own thing and you are enjoying it… then that's great, too. But, as I've suggested to you before, it's my personal view that the average of musical tastes in human cultures have something to do with a bit of genetic input as well as cultural input… and there are natural inclinations humans have in regard to sound. Musicians are often explorers with unique abilities that enjoy unique aural outcomes. But audiences are usually more average and enjoy more familiar outcomes. In any musical pursuit where the outcomes are more unique, they are at the same time less accessible to the average audience. ME: Bob Moog strapped a keyboard to his modular synthesizer and Don Buchla did not. Who got it right? Ok, no, I'm teasing you! My serious question is is the traditional musical keyboard and the musical theory which goes with it, which is the product of a very situated, Western understanding of musical theory, a limitation we need to get past or a blessing we need to embrace as fully as possible? Should synthesis be limited by the design decisions, technological limitations and artificial choices of centuries ago? Wouldn't the clever minds out there be better employed finding and using new ways and methods? Marc: While certainly, the keyboard was designed in a specific way for a specific concept. There were reasons that the white notes were white and flat, and the black notes were fewer and pointy. But those reasons are less important than the fact that the keyboard is actually a pretty ergonomic AND powerful means of triggering sound. We can apply all of the music theory of the Western tradition to the keyboard if we want, but we don't need to. When keyboards were triggering strings or tines or tubes of air, they were quite rigid in that tradition. But what Bob knew when he applied the keyboard to the synthesizer was that the keyboard no longer was bound by really anything. The very first Moog keyboard controllers were designed so that the user could define how the keys applied to the sounds being created. They were not limited to specific notes per octave. They were not limited to any specific tuning. They were not even limited to pitch direction. You could DEFINE how this "row of buttons" triggered or controlled your sound. And weirdly, no one ever thinks about that when they're talking about the keyboard and Bob Moog. Vladimir Ussachevsky was very concerned about the ASSOCIATION people had with the keyboard… but that was the body of his concern. It wasn't that the keyboard could only play linear notes of the 12-note octave. It was that people might be inclined to use it that way. And some did. But also, many did not. I understand that non-keyboard controllers are more consistent with the concepts associated with traditional Electronic Music. As Electronic Music was meant to be an escape from all tradition wherein the user could personally define timbre, performance, etc., new tools and interfaces seemed to be the right thing to do. 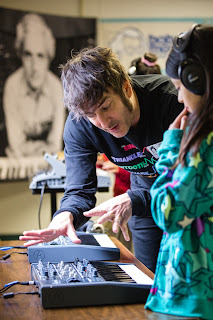 And, as I've said before, Bob Moog was right there at the forefront… having started out as a person who was an expert at making the most unique musical interface of all time… the theremin. Ultimately, the problem is that for an interface to be the most successful, it has to be the perfect balance of ergonomic, expressive, and as intuitive as possible. There are people creating all sorts of interesting electronic interfaces that employ unique technology and weird interfaces… but if the musician has to go to great lengths to use it OR finds that it doesn't work in a fashion that allows their full expression… it's merely a novelty. Musicians need the intersection of intuitiveness and expression in an interface. And the keyboard, despite its ancient associations, happens to provide a literal visual portrayal of what it does and what is needed to operate it. It can be used in any way to trigger anything, and many people already have physical experience with them. That's about it. Of course, that's not to say that there couldn't be new interfaces that suit new or different needs or intentions. Heck, I recently purchased a Haken Continuum. It is the unique realization of a number of factors of expression. While it kind of resembles a keyboard, it is much more powerful than a keyboard and allows amazing levels of complex expression. I am having to train my body to be as expressive with it as it allows, but learning is also a good thing. ME: To what extent do you think modern synthesis is held captive by the paradigm that was taken up and used by Bob Moog when he started designing synthesizers, that is to say the paradigm of subtractive synthesis? Why do you think that most synths produced today are subtractive in architecture when there are a number of other choices that could be made? Is it innate musical conservatism? Marc: Bob didn't invent a "subtractive" synth, actually. 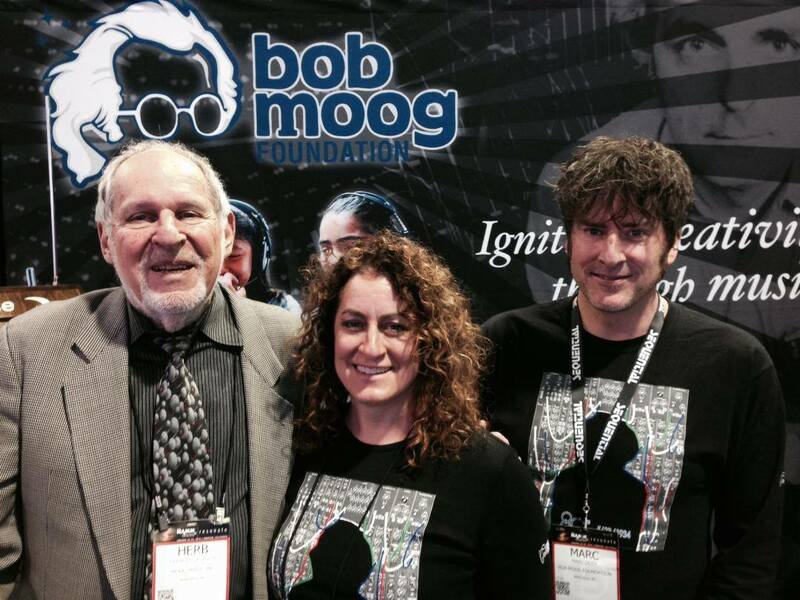 The Moog modular was capable of creating both subtractive AND additive outcomes. Or, any number of other synthesis possibilities. In 2012, when I was demonstrating Erik Norlander's massive Moog modular "The Wall of Doom" at NAMM in the Bob Moog Foundation booth, the very first thing I did was tune its many oscillators to the harmonic series and start creating additive sounds. Of course, with the pitch instability, I had to do a lot of retuning, but still… I could create amazing sounds never even touching the filters. 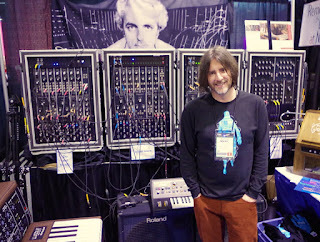 Marc with Eric Norlander's "Wall of Doom"
But there is no denying that Bob's paradigms became the standard. The Minimoog set the standard for synthesizers to come. I also believe that it was people's desire to imitate the timbres they heard in Switched-On Bach that was also part of what set the standard. Synthesizers became more-traditional instruments not because of Bob's subtractive efforts, nor the keyboard, but because of the associations of the general public regarding popular music. And those associations led to expectations in those who sought synthesizers… and those expectations essentially came down to "I want something like a Minimoog." Since then, it has become a sort of traditional interface. I wouldn't say it was conservatism, I'd say that for some reason, in the culture of synthesizers, users are more concerned with emulation and association than they are authorship. ME: What's the best new synth you've interacted with? I understand you have big love for the Dave Smith Pro 2. Is it that? Marc: Well, that's definitely one. For me, it is a wonderfully functional and expressive interface that is packed with tools and functionality. It is so powerful, has such a great sound, and features an intuitive and easy interface that allows access to everything. I basically have found that I can do everything I think of with it. And that's never happened with a non-modular synth before. ME: A nice easy question to finish, Marc. What is so great about vintage analog tone? Marc: I can't speak for everyone, but I can say that while I love the way that synthesizer tones often sound so alien and strange… and how their precision and stability creates a weird and enjoyable experience for human ears… I also love the way that certain synths can sound like natural, acoustic noises that happen in physical experience. Analog tone is that for me. When an analog synthesizer has true analog tone, it doesn't sound like a weird spacy alien sound, it sounds like a new acoustic musical instrument. There is natural beauty in the various distortions or instability of waveshape, tuning, and amplitude that is reminiscent of acoustic sound. That's what I like about it. I want to, of course, thank Marc for taking the time to answer my questions. If you agree with, or take issue with, anything he has to say please feel free to have your say in the comments.